How do you write a short story? How is writing a short story different than writing a novel? These are tough questions to answer because there are as many types of short stories as there are types of novels. There are long short stories, short short stories, simple short stories, and complex short stories. If you’ve never read a short story, you’re going to have a difficult time writing one. Even if you’ve read hundreds of stories, studying one or two closely will help improve your understanding of the short story form. If you’ve never read a short story, you’re going to have a difficult time writing one. To find a few good short stories in your favorite genre, check out our free resource, 46 Literary Magazines to Submit To. Logline: A lonely, Southern woman is found dead and decaying in her home after being abandoned by her lover. The formula is your character + a descriptor (e.g. lonely, Southern woman) followed by an event (e.g. found dead) followed by a conflict (abandoned by her lover). This will help you understand what your story is about. Some guides suggest focussing on writing a catchy first paragraph first, but while that’s important, it puts a lot of pressure on you when you’re first getting started writing your short story. Instead, just write. Just put pen to paper. Don’t worry about what comes out. It’s not important. 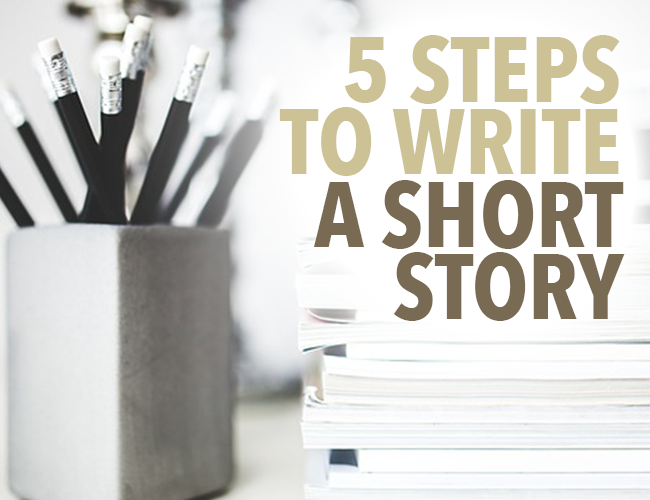 You just need to get your short story started. You will need to write 50 to 100 percent more words than will end up in the final draft of your short story. That means if you’re trying to write a 5,000 word short story, you might need to write 10,000 words total in your first draft. Why? Your job is less to write words than to pick the best words. To get a good short story, you will have to cut out a lot of mediocre writing. All good writing is rewriting. After you write your first draft, you need to start cutting, rewriting, and editing your short story. This is the hardest part of writing a short story, and can feel like wading through a swamp or climbing through a very tight cave. However, don’t give up now. You’re almost there. To make rewriting easier, I highly recommend the word processing program, Scrivener, which makes organizing your work much easier. Before you submit your short story, make sure you’ve read it aloud several times to find typos and grammatical errors and that you’ve formatted it according to standard manuscript format. Then, skim several literary magazines in your genre and read their submission guidelines to know if your short story will be a good fit. Finally, it’s time to send your baby out into the world. Don’t over think it. Just do it. It will be hard to let go of your short story, but you can’t get published if you don’t submit. For a more complete guide to writing and submitting a short story, check out the work book 15 Days to Write and Submit a Short Story. It will walk you through the whole process of writing and submitting a short story. 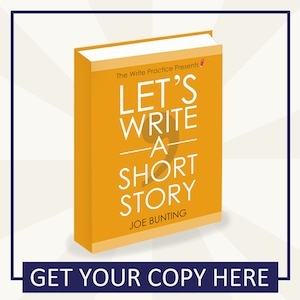 It also includes over 25 writing prompts and more than a dozen inspiring quotes from great writers to kick your short story writing into action. Write your short story today! ←How to Write a Short Story: Should You Focus on a Mood or Event? Question, Joe: I was looking at the link about Scrivener and I noticed that there plenty of upsides to using it for writing a novel but I was wondering what are the plus sides for using it to write short stories? I find I personally don’t need much organization for my short stories but is there anything else I might find useful? its my first time writing a short story but i cant think.What should i do first before writing a short story? i just thinking why do people have a problem. Muhammad ali, a young entrepreneur, and Ayesha, the daughter of a rich man, are in love. When Zabiullah, Ayesha’s father, hears that she is pregnant, he does not agree with her being married, and does everything he can to separate the two lovers, telling to Muhammad ali that Ayesha died. When the time comes for Ayesha to give birth to her baby girl, Zabiullah takes the baby and gives it to Farid, one of his servants, forcing him and his wife Farhanaz to raise it, along with their own daughter, Arzoo, and to leave his house. He gives them money, promising that he constantly will send money for his grand-daughter and asks them to keep the secret. Before their leaving Zabiullah tells Farid that Farhanaz wanted her baby to be named muskan. Then he lies to Ayesha that her daughter died at birth. For the next 20 years muskan, who is now young and beautiful and has pure soul, lives in kabul and leads a modest life. Due to financial problems, she left school and worked in a pastry shop to help her family. While muskan is optimistic and hardworking her sister Arzoo is exactly the opposite. Although muskan strives to make her sister happy, Arzoo on purposely hurts her out of jealousy. As the time passes by, the secret about muskan becomes harder and harder for her real grandfather, Zabiullah, and at one point he decides to tell everything to Muhammad ali. So he goes to his working place and tells him that he has a girl with Ayesha who was raised by some servants. But before the old man to be able to reveal all the secret that puts pressure on him, he accidentally dies in the house of Farid and Farhanaz, who secretly bury him in their garden. Now muskan should inherit a fortune that she hasn’t ever dreamed of, she should live in a big mansion and live more than plentiful life. Though, farhanaz and Farid have a plan. khushboo will not know the truth about who she is, because they will say that Arzoo, their daughter, is Muhammad ali’s daughter. Therefore, khushboo continues her modest life, that actually does not belong to her. Will muskan and Muhammad ali ever learn the truth? Will she take back the stolen life from Arzoo. My english is not as good as those native english speakers but could manage with grammar and stuffs but have lots of concepts can i go on with this same english witout using much technical or sophisticated words…. 1. It automatically export finished manuscripts in the format that literary magazines like to receive it. 2. You can use it to organize scenes, and if you need to move scenes around to experiment with how the story flows, that’s really easy. 3. If you want to self-publish a short story, you can export it as a Kindle or ePub file in seconds. It’s definitely worth it, in my opinion. hi my name is Selena Earle am writing a short story about my childhood life and was asking for some tips on how I should go about doing so . Thanks for these tips Joe! I didn’t do these thing in the exact order, and your suggestion for a summary reminded me that I forgot to add one to my first short story. I see where thinking up the summary first might help, too. On this particular one, I found something that cued my interest, got me wanting to write. Then, I researched until I felt I could achieve my length. Summary: A beautiful Blue Dragon, Slug, leaves its lair in a struggle to survive. I also find that short stories people write are not really short stories, that they are more like snapshots of a much bigger story. What do you think of these? Review:Identify the personification used in each sentence. 1. The brooks murmurs softly. 2. The weeds marched through the ground. 3. The wind whisper, sobbed and waited. 4. The gentle raindrops played a lullaby on the roof. 5. The snow icy cold fingers tickle my nose. I truly liked the tips. Thanks for sharing them. But seriously, if anything, it’s probably easier to write a short story in 35 minutes because you can’t mess around. You just have to write! Have fun, Malika. guy i want to teach english compeletly can u help me plz? Has anyone any experience using Apples iBooks Author? An interstellar merchant ship, limping into port for repair, believe they are being followed by a notorious pirate ship; discovering all they have as a weapon is a cargo of really old cheese, they “throw” the cheese at the pirates, win the day and destroy the pirate ship. Hi joe, how can I start the story by describing the setting? Because of you and this article, I’ve just finished the first draft of a story. I had been working on a novel for a few years and it wasn’t going that well. But, in less than 3 hours, I was able to use the same characters, different story, to write and finish a story finally. Thank you very much. I find that publishing motivates me because i wrote this story for a literary magazine, word riot, and hope that after revising, they will like it. I think it is better to start with short stories and prose before getting into novels. That being said, I’m looking forward to camp. im a volunteer for a library and i want to do a hour or 2 writing workshop to help teens start a book / short story on their own any suggestions on how to start? Why not have them an introductory paragraph about themselves to get used to the idea of writing short fiction? Good info, enjoyed reading this! These tips are beautiful, and I’m glad I’ve unconsciously been using them. I’ve written a collection of short stories, but it’s difficult finding literary magazines here. Anyway, you’ve encouraged me to read and write on. Hi! this is my first comment on this site! First of all I want to say I m a big fan of it! I love the articles and the tips! Maybe my comment is offtopic but I really need a suggestion…I m Italian with a discrete level of English and I would like start writing short stories in English…is that crazy? I mean, …I already know I will need time to reach a level of English that allow me to write at least a decent story( I don’t live in a country where I’m surrounded by English people,even if I use English sometimes for job )…and I know I will hardly get the confidence I can have writing in my native language but I really would like to do that in order to better take advance of this community! where are all my comments?! I left three, asking for a bit of help with a story im writing about two radioactive girls who run to Chernobyl, and there gone! why have they been taken down? ps: could you guys suggest possible twists for the end? the scene is this… Ashleigh and Cheryl have found each other in Chernobyl after they run there after a nuclear explosion in LA(its a dystopia) could you guys help me please? Great steps in there. Thank you for sharing! І’m vеry pleased to find thіѕ great site. I wanted to thank yօu for ｙour time due to this wonderful read!! Hello,I read your blog named “5 Steps to Write a Short Story” on a regular basis.Your story-telling style is awesome, keep doing what you’re doing! And you can look our website about free anonymous proxies.